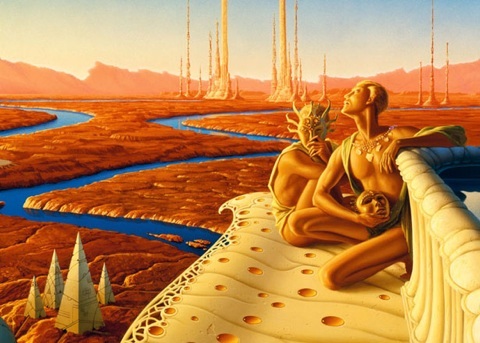 If there’s one thing that became clear after finishing Bradbury’s The Martian Chronicles, it’s that we humans should stay far, far away from Mars. And not just because it’s a dangerous place for humans to be (as evidenced by the first few rocket landings and the fates that befell those crews), but mostly because humans would ruin Mars. 1. You can’t truly settle on land (or a planet) that’s already inhabited. This makes for either threats to the humans’ lives or the (near)extinction of the natives. This is evidenced by the killings of the first few rocket crews and the (near)extinction of the Martians by the chicken pox for which they had no antibodies. This is a throwback to the European settlers who inadvertently crippled the natives of the lands they ‘discovered’. 2. We’re humans and think in human ways. Earth is our home and therefore any other planet we’ll ever inhabit will be – forcefully – hammered into an Earth-like environment. We’d take everything that makes Mars Mars and destroy it and change it so completely that it makes Mars Earth. Or Earth-like enough, so the humans would feel at home. We’d bring our Earth laws and our Earth ways of taking care of our planet, instead of accepting that Mars is just different and adapting to the planet. Humans (and other humanoid creatures) will always view their surroundings from within the framework of their own established world. This is evidenced by the 4th rocket crew not caring about the extinction of the Martians and the poor face-changing Martian who just wanted to be loved dying because of the selfishness of the humans and not even being buried, among other examples.